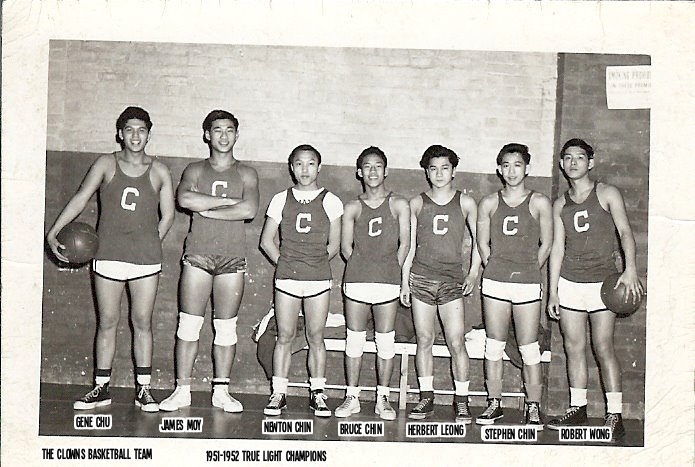 Especially for all the interested “oldtimers” of that era, I am attaching six photos with the following note which is what I remember (I think) about the Clowns basketball team at the True Light Lutheran Church in Chinatown. 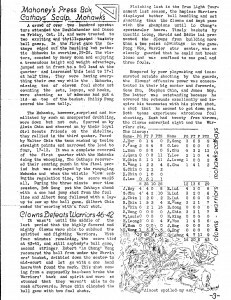 Pages 1 & 2 The 1st photo is a sports write up, probably by Jan Wong, in a 1950 TRUE LIGHT NEWSLETTER (courtesy of Bill Chang) about two games during the 1950-1951 basketball season in which the Mohawks played the Cathays and the Clowns matched up with the Warriors. The ANNOUNCEMENTS section (2nd photo)brought back memories of the games, dances, scouting, Rodeo trips, Halloween, choir, politics, Korean war draft of three of our guys, etc. Note the “Adult Movies” church announcement at the bottom. How meanings have changed. 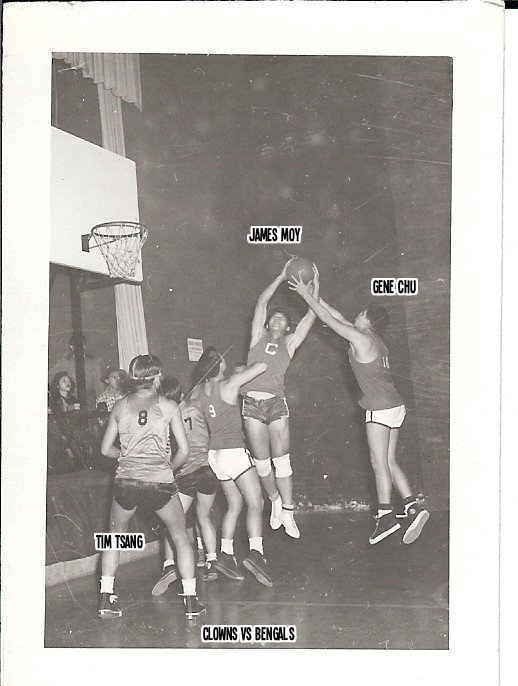 Since my name is not in the above 1950-1951 team boxscore, I must have joined the Clowns during the following 1951-1952 season. 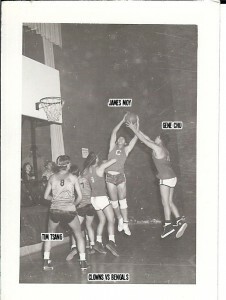 Methinks I served as the player-coach then. 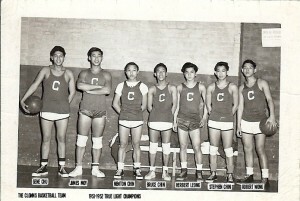 The 3rd photo shows the 1951-1952 True Light champion Clowns (who may have also been champs in the prior 1949-1950 season as noted in the above newsletter) from L to R: Gene Chu and James “Yee Gan” Moy (our own “twin towers”), Newton Chin, Bruce Chin, Herbert “Gee”Leong, Stephen Chin, Robert “LoChong” Wong. 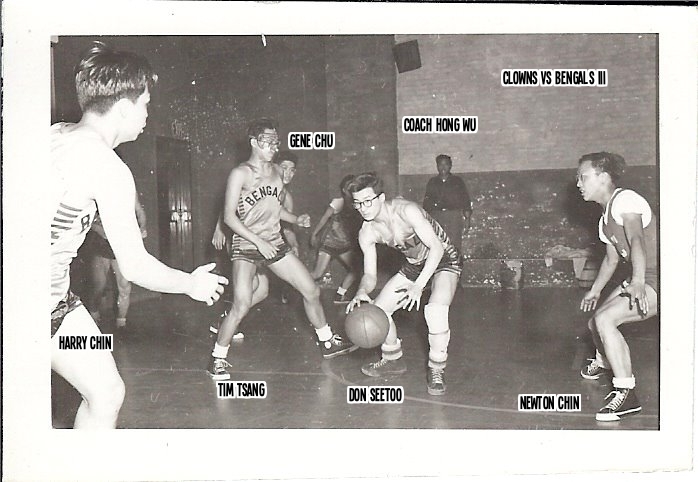 I believe the 4th, 5th & 6th photos show scenes of a game between the Clowns and the Bengals (the seniors, coached by Hong Wu) played at the True Light gym during the 1951-1952 year. If I remember right, the teams in the tournament that season were the Clowns, Bengals ( the senior team with Don Seetoo, Herbert Leung, Tim Tsang, Harold Louie, Harry Chin etc), Warriors (with Harold “Cheezy”Lui, Ed Lui, Fong Woo aka Steve “Fongie” Chin, etc. 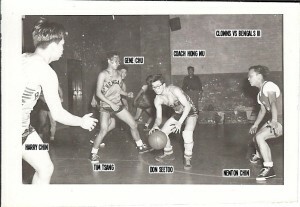 ), PACS ( older college students Jim Seto, Gabe Mar, etc. 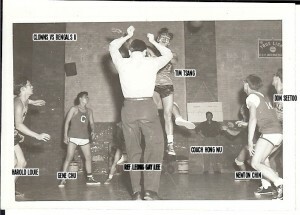 ), Mohawks, Wildcats, and maybe others. 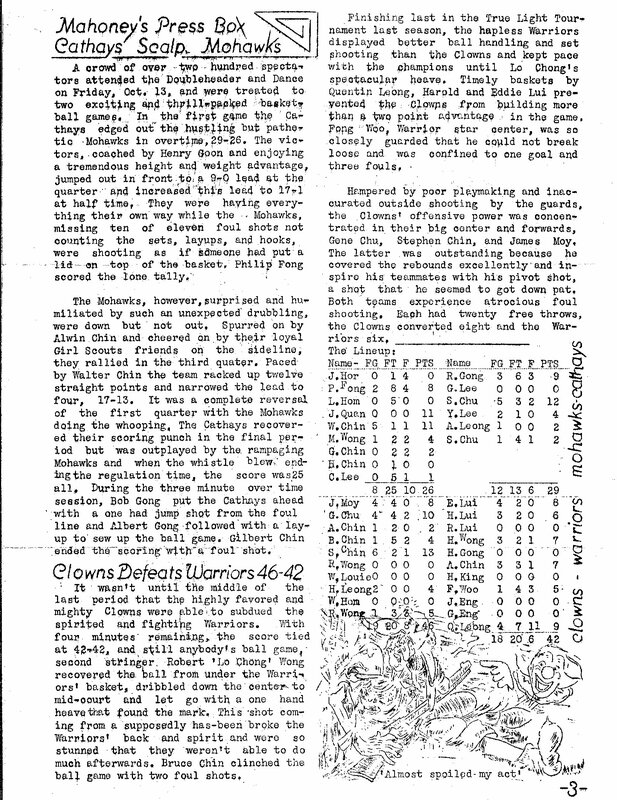 The champion Clowns must have disbanded when the younger “clowns ” entered college and I went into the service. 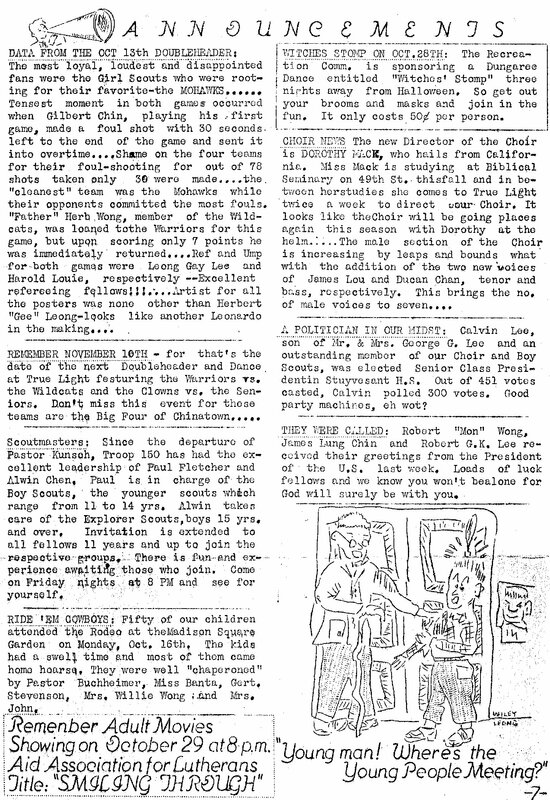 I recall a rendezvous in Chicago one weekend with James “Yee Gan” Moy and Gilbert “Poygie” Chin (Mohawks) when they were students at Valparaiso University (in Indiana) and I was with the US Air Force in Ohio. Our enjoyable reunion took place probably in 1953. 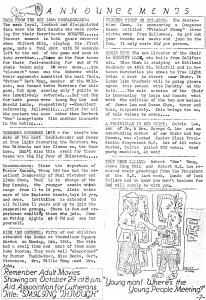 After looking at these photos and the True Light newsletter as well as other posts, one can’t help but think that life in our Chinatown back then was like that of many other small towns in America.